It takes only the sound of a steak sizzling to make us salivate with hunger, so one can imagine how we reacted when we heard that Treasury Brisbane was teaming up with The Gambaro Group to bring its award-winning Black Hide concept to Brisbane City. Tomorrow Friday June 8 will see Black Hide by Gambaro at Treasury Brisbane open within the heritage surrounds of the iconic entertainment precinct, complete with a jaw-dropping selection of steaks, sumptuous seafood and a globe-spanning wine list. Black Hide by Gambaro at Treasury Brisbane occupies a revitalised portion of Treasury Brisbane’s interior, making perfect use of the heritage structure to create a sense of refined opulence. Heritage architect Andrew Ladlay and design consultants Plus Architecture were recruited to help fashion the space, which boasts several refurbished rooms imbued with a tasteful bovine theme, paying homage to the hero protein. After passing by the dry-aged meat display at the entry, patrons are guided into the Hide Room, where the restaurant’s grand splendour is first revealed. 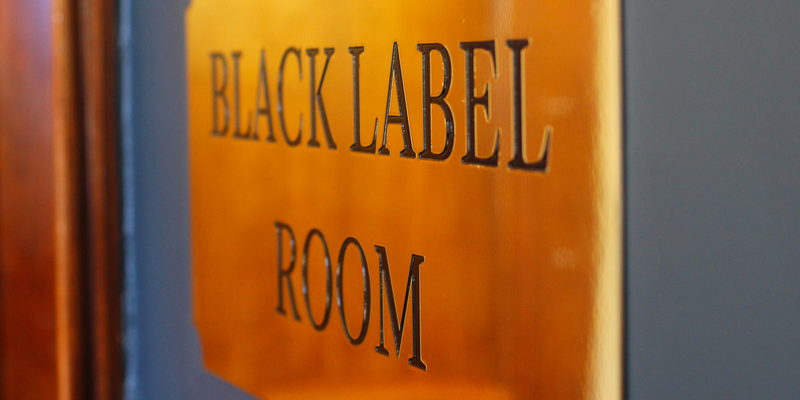 Across five additional rooms – the Carving Room, Butchers Room, Parlour Room, Paring Room and Black Label Room – the restaurant charts a sensory journey touching on taste, sound and smell set within a timeless setting. The Carving Room houses an impressive solid timber wine display that contains 150 bottles of Black Hide by Gambaro at Treasury Brisbane’s finest drops, while a metal knife display behind the maître d’ station showcases a collection of knives engraved with the names of the Black Hide Knife Ambassadors. The restaurant’s bar features gunmetal steel fin detailing, LED lighting and black and white mosaic flooring, reminiscent of the traditional carveries of bygone generations. To gauge the veracity of Black Hide by Gambaro at Treasury Brisbane’s reputation, one simply needs to cast an eye over its menu. 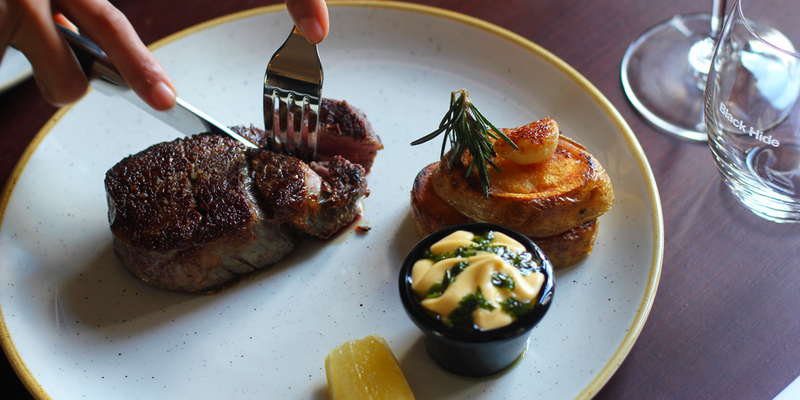 The restaurant showcases one of Brisbane’s largest selections of world-class Australian wagyu and Angus cuts, sourced exclusively from Stanbroke Beef. Situated at the head of the menu are an eye fillet and sirloin cut of wagyu each with a marble score of nine – the highest by Australian industry standards. These prime cuts are lovingly cooked using a Montague broiler grill and slice like butter, so tender as to melt once it hits your tongue. Other steaks are divided into marble scores of five or three, or dry-aged, with various cuts – including the famous tomahawk – on offer. The mains are rounded out by the likes of Moreton Bay bugs in lemon caper butter, live lobster, roast duck breast and pork belly. Finally, guests can supplement their order with house-made sausages, freshly shucked oysters, steak tartare, caviar and barbecue beef short ribs. 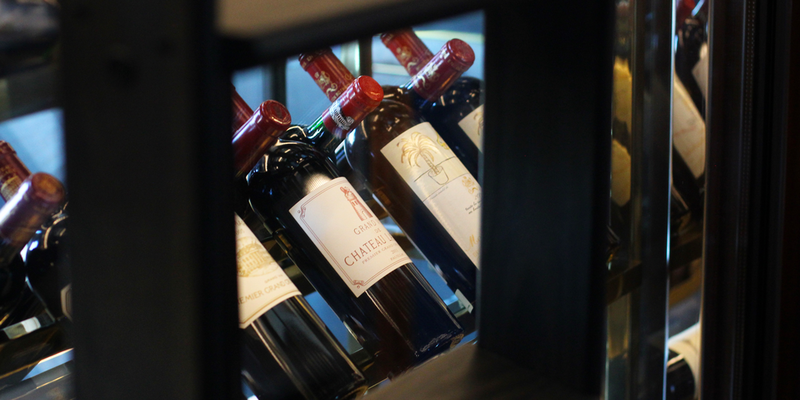 Complementing the restaurant’s stellar steak selection is a vast array of wines. Black Hide by Gambaro at Treasury Brisbane’s list takes in the width and breadth of Australia’s finest regions as well as choice drops from across the globe. From Piedmont and Loire Valley to Napa Valley and Margaret River, each varietal has been handpicked to suit every palate. Those with a taste for the finer things can browse the restaurant’s supreme reserve cellar range, which includes vaunted labels like Château Mouton Rothschild, Vega Sicilia, Opus One and Penfolds Grange. The bar is also well stocked with a choice selection of beers and spirits to cater for all tastes. Black Hide by Gambaro at Treasury Brisbane will open to the public on Friday June 8. For more information, head to the Stumble Guide.